Is KARATBARS The Best Home-Based Business In The WORLD? There are many business opportunities that claim to be the best. Many people are in search of the best home-based business opportunity. However, the best home-based business opportunity is not that easy to find. I started looking in 1972 and didn't find it until 2013, 41 years later. The key to finding the best home-based business opportunity lies with understanding that the best home-based business does exist, but it is not the same for everyone. I believe Karatbars is the best home-based business in the world, and here's why. There is a wide assortment of different home-based business opportunities available in almost every market and in almost every business category. The choices seem endless. So it isn’t surprising that people are looking for someone to tell them what the best home-based business opportunity is. 1. What type of product or service do you want to sell? This is a big question and will point a person in the right direction of where to look for a business opportunity. For this reason, I believe Karatbars is the is the best home-based business in the world, because Karatbars product is money, real money, GOD's money, 999.9 24 karat GOLD money. And JP Morgan said it best, " Gold Is Money; Everything Else Is Credit. And once you realize this, you will never be poor again!" Everybody is working for money, but very few people are working for GOLD. In Karatbars, we help people open a Gold savings account by exchanging some of their declining paper currency into real money, Gold. And Karatbars pays us in Cash and Gold for doing it. Karatbars is the only company on the planet where a person can earn an income helping people acquire a savings in the same quality of Gold that the wealthy, Financial Institutions and Governments use to settle their debt. And Karatbars does your accounting, your delivery, your storage, and pays you every Friday on their private issue Mastercard. And only 1% of the population owns Gold, and Financial Advisors tells us that 100% of the population should own Gold. And that, my friend, is a GREAT Opportunity that I don't intend to miss. I have been earning a residual income in Gold and cash every month since August, 2013. I borrowed seed capital of 2K to start my Karatbars Business at the highest percentage. I paid my loan off at the end of my first 8 weeks. And I have been positive cash flow ever since. But you don't have to start at the highest percentage if you don't have 2K laying around. You can start for less than $400, and build from there like so many of our team members have done. 2. How many hours do you want to invest in the managing of the business? Some businesses require very little back office time because they are fully automated. Some other businesses require a lot of back office work, though. In Karatbars, your back office is fully automated. You can focus all your attention on getting customers and affiliates for your business. In Karatbars, everybody is a customer first, and affiliate second. In other words, you want to set up your monthly savings, then you want to go help others do the same. Some will want to become affiliates, some won't. But everybody is a customer because everybody has a need and a desire for MONEY. It matters not what the market does, because when you can acquire your Gold through your earnings, without having to go into your pocket, whenever you have to liquidate some of your Gold, it's all profit, PERIOD. Now that's the kind of system I want to be a part of. 3. How many hours do you want to invest in the operation of the business? Again, some businesses require a lot more time for the operation of the business than others. In Karatbars, you can decide how much time you devote to building your business. We have systems, webinars, conference calls, and web pages to allow you to tailor your work to the time you have available. If you have a situation that requires you to not work your business for weeks or months, our marketing system is so robust, and Powerful, that in many cases when you return to work your business, you will have more potential earnings when you get back than when you left. Our system is called a Dual Team System, and it's Very Powerful. 4. What skills do you have and what skills do you lack? This can really dictate the type of business a person chooses. Some businesses require more technical skills than others or more of a certain type of skill so it is important for a person to know their strengths and weaknesses. In Karatbars, you come as you are and there are tools for every level of efficiency. We have very simple techniques that anyone can apply to build their business. It just requires desire, and a willingness to learn new things, and then apply what you learn. 5. What type of income are you looking to make? Some businesses can provide a more steady income than others, but may produce a lower amount of income. Then there are the opposite which can take longer to produce an income but produce a larger amount of income. These questions should give a person a good idea of what type of business opportunity they are looking for. The best home-based business opportunity will meet their needs perfectly. They will feel happy and comfortable with it. There is a best home-based business opportunity for everyone – it’s about finding it. To do that a person has to get to know themselves and how they fit into the business world. Once they understand what they want and what they can do they can easily find the best home-based business opportunity for themselves. Karatbars is the best home-based business opportunity in the world because you can decide how much you earn, and you do that by the business package you choose to start with. We recommend starting at the BEST level your circumstances will allow, be it Sliver (10%), Gold (15%), or VIP (20%). Whatever level you start at, you can upgrade to a higher level by paying only the difference plus a small administrative fee. You have a product that solves a problem in every country on the planet, and that is the loss of the purchasing power of their paper currency. Karatbars is an E-Commerce Company operating in 119 countries, and you can do business in as many of them as you have the desire. Karatbars has open the opportunity for businesses to participate in being able to accept our Gold as a mode of payment for services by becoming a K-Exchange. This is an added revenue stream for those affiliates that want to participate. And our Founder and CEO, Mr. Harold Seiz, shared more details of that at our Freedom Celebration in LA last April. What Is Your Story? This One Is Mine! I am experiencing The Greatest Success of My Life, and I almost Missed it! Will You? I was introduced to Karatbars by my friend and business partner, Lourens Haasbroek from Sout Africa, who I met online. We started working together January 2012 and we did not meet face to face, for the first time, until January 2013 in San Diego for another project that we were working on. That is us in the pic above in San Diego at that Event. He introduced me to Karatbars, and I opened my Free account on July 27, 2013. I was able to borrow 2 Thousand Dollars from a dear friend that said, they had to pray on this and GOD told them to give me the money. On Wednesday, July 31, I bought my VIP package, and two days later on Friday, August 2nd when I got my paycheck from my J.O.B at the grocery store, I exchanged some of my cash for 4 grams of Gold for the four weeks in August, and I went to work. I went to work, alone, in my city of Des Moines, Iowa, where there were no Karatbars anything, but me and my GOD. I signed up my 1st VIP in Thailand and my 2nd VIP in Denmark. And in my first two weeks, I had earned my entire loan with 100's of dollars to spare, although I did not pay my loan off until the end of my 8th week. In my 8th week, my family Doctor, and my friend of 20 years, Dr. Kevin Moore, in the pic above on my left, joined me. Later that same week, his step-son, Rashard Duncan, to my right, joined us, too. They both became VIP's and we have been working together as a team since October of 2013 to this day. 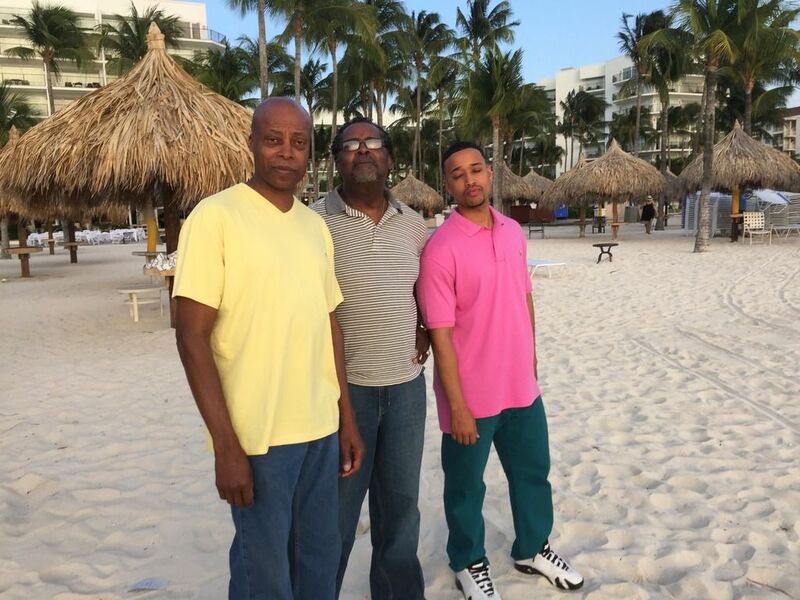 The pic above is the day we arrived in Aruba for a Karatbars Event for our team in April of 2015. The pic above is our team's incentive winners with me next to our Founder, Mr. Seiz, and Rashard is at the other end next to Tammy Morrison, the #2 Karatbars affiliate in America. That is the pic of our team in Aruba below. I'm on the 2nd row from the bottom, 3rd from the left, in the black jacket with the light gold shirt. I have been looking for the best home-based business since getting into my first home-based business in '1972' called AMWAY when I was just 22, and I did not find the best one until 41 years later in July of 2013. That is a long time to look. Save yourself some time, effort and money, my friend. Oh, by the way, that's the acronym for S.Y.S.T.E.M. lol... Karatbars is THE ONE! You don't have to look any further. Karatbars has changed my life. After 9 months in Karatbars, I was able to quit my J.O.B. Since March of 2014, I have been doing what I call Community service with a stipend at the grocery store that was my J.O.B. Now I go there on Tuesday and Wednesday, ONLY, just to keep it Real, give back to my community, and to stay in touch with regular people. 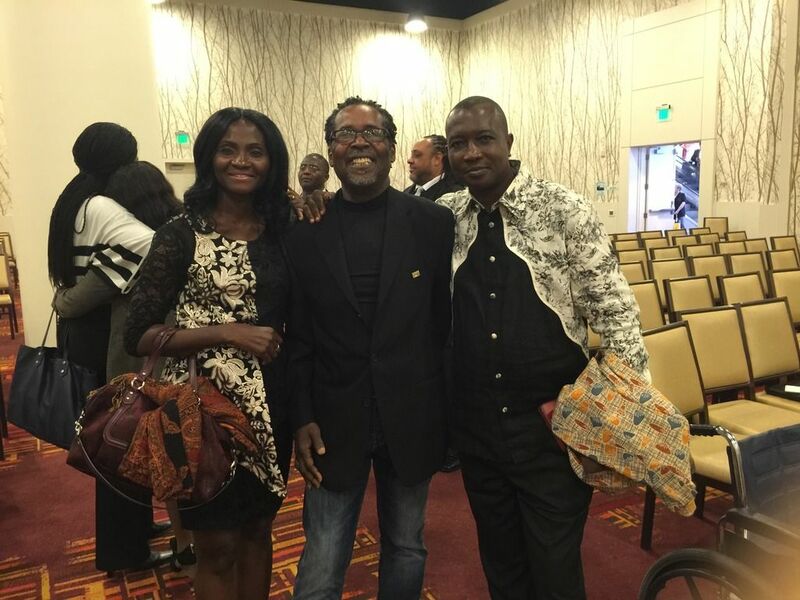 The pic above is me with one of our Leading couples, Amaka & Austin lzuka Ashikodi, who traveled from Nigeria for our Freedom Celebration in LA last April. Also, they were the first in my organization to own TWO VIP EXCLUSIVE Accounts. My organization from me down, as of this moment, numbers 20,999, and is growing daily. My organization is in Thailand, Denmark,The UK, Nigeria, Kenya, Ireland, Tanzania, Israel, all over the U.S. and Canada, and in other places I don't know about. Karatbars has allowed me to accumulate over 600 grams of GOD's Money, GOLD, and only the first four grams were paid for out of my pocket. That is over 600 grams that were paid for through the SYSTEM or earnings, in other words, ZERO DOLLARS out of my pocket, and whatever I liquidate any or all of it for, will be at a PROFIT because I paid my seed capital loan off in my first 8 weeks, and I have been CashFlow Positive ever since that time. Since August 2013, Karatbars has been paying me in Gold and cash monthly or weekly on our private issue MasterCard. Karatbars is the best home-based business that I have ever been a part of, and I am experiencing the Greatest Success of my Life. I believe Karatbars is the Best Home-Based Business in the World. If a little country boy from Little Rock, Arkansas, who didn't go to college, and only finished the 12th grade can do this, You Can Too! Karatbars is not just the best game in town. Karatbars is the ONLY game in town. Karatbars is the only place on the planet where you can get 999.9 24 karat gold bullion produced by LBMA certified refineries, and get paid in cash and Gold to save and share it. I have been able to acquire over 19 OUNCES, over 600 grams of GOD's money, Real money, GOLD, through a SYSTEM that allowed me to pay ZERO DOLLARS out of my pocket for it. Say what you will, but you can't get better than FREE, my friend! This SYSTEM is paying me in Cash and GOLD every month and has been since August of 2013. And I have had to put NO More cash into my account since purchasing my business package, that I paid the loan off for at the end of my first 8 weeks. Don't let Karatbars pass you by. This is your Microsoft Moment. Come join us, and save in Gold, and get paid in Gold and Cash to do it. And share it with everyone you love and care about. Just open your Free account ===> HERE! And let's go to work together and build this. And let me be the first to WELCOME you to our team. WELCOME, to our Awesome Gold Savings family, my friend! And, please, enjoy our just released New Karatbars Magazine. L Basheer (LB) Hasan - Your Senior Partner - Do You Have 8-Minutes? This is so beautiful L.B. I am so inspired and maybe I should share mt story although I am not yet there. I am still climbing up the ladder. Thank you, Myoma, for your kindness. Just know that you are writing your story with the actions that you are, and will take. That was the thought I had in mind in the very beginning, how did I want my story to go. You are the creator of your story, darlin. Make it a POWERFUL ONE! This is so nice and motivating L.B. I am so inspired and motivated. I believe one day I will be there. Presently, I am still trying to grow. I will appreciate any help from you to grow. Thank you. That is exactly why I made this post, Phillip, so that you can KNOW that you can do it. Please watch the video that Thomas and I made on Swiping and Swipe my 8-Minute post and put your links in it, and send it everywhere and get in here and learn how to use this platform. It will explode your business, my friend. Love you, too, Chuck!!! Thank You! Very inspiring L.B, thanx for the motivation. Thank You, Ngozi...I Love My Team!!! Powerful testament, thanks for the inspiration. Thank you Regi. Thank you, Rigo. Remember, we choose how our story goes by the Decisions we make and the Actions we take. Success lies outside your comfort zone. And remember also, that Successful people do what UnSuccessful people are Not willing to do. Thank you both for your kindness. It is a choice to be where you are with who you are. That is so true, Gordon. And thank you for joining us in MarketHive in the Rise Of The Entrepreneur!